In this episode, the kids deal with a possessed bike in the middle of nowhere. Meanwhile, in a completely unrelated and unimportant subplot, Impmon sells his soul to the devil. 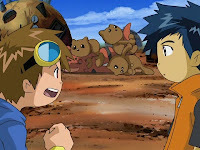 For the sake of discussion, we will have to pretend that this episode is about the tamers and their adventure with the crazy motorcycle. Really, the main plot is a silly adventure to keep us entertained while Impmon makes the most agonizing decision of his life. The act itself isn't as important as the events leading up to it and the events that follow, which is unfortunate as it should have included more angst than there always was. On the surface, the motorcycle incident is just a random time-waster with neither consequence nor character development. The bike in question is terrorizing a bunch of bumpkins. 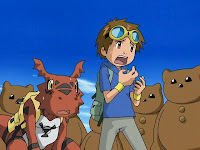 While defending the village, Guilmon ends up on the bike. But in Forgotten Village of Discarded Data, bikes rides you! Despite Jeri bringing up similarities to the red shoes fairy tale, one good hit from Leomon is all it takes to knock Guilmon off and send the bike back to hell. Nothing much to see here, right? It's more about character moments that may not be significant or all that surprising, but are worth discussion in the way that they shape the group as a whole. If the neat sweep over the Digital World landscape is to be believed, this is all happening after Rika, Kazu and Kenta made their daring (and physics-defying) hang glider escape from the valley. That means they've been separated for a night and frustrated after hours of futile searching. They keep looking, but Jeri starts wearing out and Takato is desperate enough to wonder if jumping in a data stream would help. It's a bit rough. So it's no surprise that they're all a little unhinged. Most notably Henry, whose calm demeanor has been stripped away, leaving him testy and disagreeable as they face what amounts to a moral dilemma- while the Chuchidarumon have given the tamers food and a place to rest and could really use some help, the tamers really have better things to do and the Chuchidarumon are content sitting tight and accepting the bike's murder spree. Henry is dead set on leaving them be, screaming at Terriermon when he suggests staying to fight. When Takato is inclined to help as well, Henry sternly requests a word in private. It's apparent that despite the way things have been going, Takato is still a nice guy and wants to help anybody, no matter how insignificant. That's wonderful, except that you have to wonder if Takato's just awesome like that, or if he simply doesn't realize how badly things are going and thus doesn't have his priorities straight. In many regards, Henry is right; not only do they need to get going and the Chuchidarumon seem content in their misery, but there's all sorts of prime directive-ish implications of running in and using their tamer powers to save some simpletons. Jeri is coming across as bold and careless, shouting at whoever's hiding in the village and sampling their food before verifying that it's actually edible. Leomon might be the only one left with their brain working properly right now. 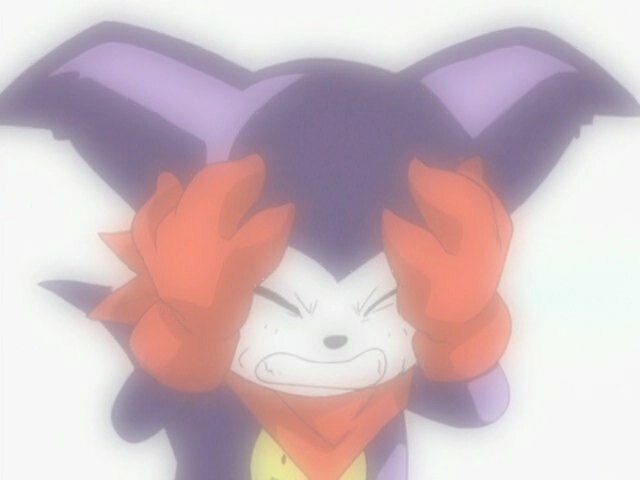 But yeah, this one's really about the moment Impmon sells his soul in order to fulfill his desire to be strong. Dragged into the Digital World, he finds himself lost in a fog and facing the imposing Chatsuramon, who has him figured out completely. Chatsuramon correctly recognizes that Impmon really does care about humans, using an illusion to imply that the problem is that Ai and Mako don't care for him in return. He's totally right, as why would Impmon be so frustrated at Ai and Mako's selfish behavior and feel such jealously that the tamers' Digimon are using the bond with their human partners to successfully evolve? These happy relationships are what make him so miserable. Not only are his partners incapable of helping him evolve, they also are incapable of showing him the love needed for him to see that evolving isn't what's most important. The tragedy of all this is not just that Impmon accepts this deal, it's that if not for the proper bond she forged with her partner, Renamon may have done so as well in the same situation. That's all that was lacking. The Forgotten Village of Discarded Data is decorated nicely, with all sorts of cooling fans and chips and peripherals dotting the huts the Chuchidarumon have carved out. The Chuchidarumon thank the tamers for helping them survive the attack, even though one of their own gets killed, arguably due to the tamers forcing their doors open. Like many Hans Christian Andersen joints, the story of the red shoes is one that a lot of people have heard of, but few have heard the whole thing. Jeri's got the beginning part down- snotty girl has pretty red shoes that won't stop dancing. It gets so bad the girl has someone chop her feet off, but the feet keep on dancing and causing problems until she shuts herself away from society and prays for death. The good news is that she does die... so it is a happy ending! Chatsuramon mentions that the Devas feel insulted that upon death, their data is not absorbed by the tamers' Digimon. Not only do the Devas seem insulted by that sort of thing, but looking back, you get the impression that the reason the tamers did this was partially to piss them off. For all the drama about being condemned to riding the bike forever, Leomon sure seemed to solve that problem quickly, bashing Guilmon on the head with the blunt end of his sword and knocking him out. It was a pretty simple solution for what was poised to be a complicated problem. I think you underestimated the importance of the "forgotten village of discarded data", which definitely confirms that there isn't a "village of beginnings" where digimon who were not absorbed could be revived, despite what the Tamers initial hopes and the belief of much of the fanbase. 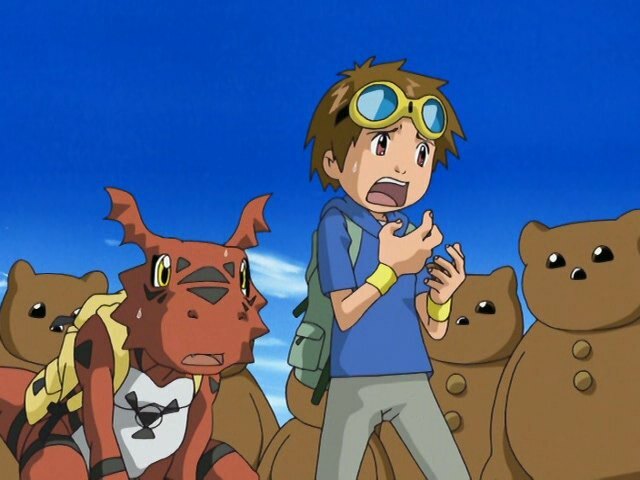 Furthermore, this episode also marks the first time Takato got enraged to the point of loss of control, complete with disturbingly shrunken pupils and stiff jaw. You'll also notice that he only got this enraged when it appeared Leomon would kill Guilmon, making this a particularly ironic foreshadowing. Finally, if I'm not mistaken this is the first time in the franchise digimon have been shown to be living in a social structure, in a natural progression from living as a family inside a single household (last episode) and living in open by itself or in a pack (two episodes). It also demonstrates quite well what it would be like to live under terror, which although nowadays associated with terrorism was usually due to rampant criminality, the likes of which were illustrated by bike gangs in the 80's. Anecdotally, It also tells parents that the best way to release people from joining said gangs is by giving a blunt tap on the head. What I don't understand is that Zhuqiaomon is capable of digivolving a relatively untrustworthy Rookie to the Mega level, but never thinks to do the same to his remaining Devas who have already proven their loyalty to him. It made sense when they had limitations in travelling to the Digital World, since only so much data can get through and Megas would be too big, but now they're in the Digital World.